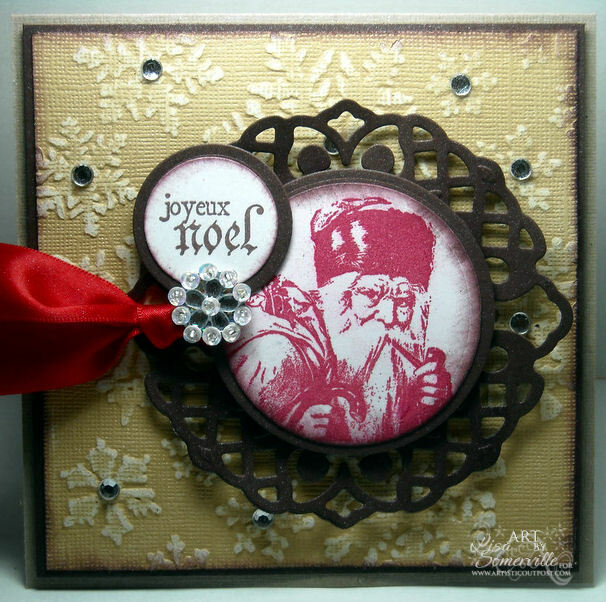 I just love this vintage Santa from the Artistic Outpost Snow Woods plate! When creating my card, I had a gift idea in mind - the Santa medallion can be removed from the card by the recipient and used as an ornament. The image is stamped in Red on White card stock, then layered on a White and Chocolate Circle, then onto the Lattice Spellbinders Die. I had a little creative help with today's card, as the color inspiration comes from the CR84FN5 color challenge of Tan, Brown and Red. The Sketch was inspired by Card Patterns Sketch #91, the embossed Snowflakes on the Core'dination paper for my background was inspired by this weeks Tuesday Trigger at Moxie Fab. This card also fits the challenge at MFP to use a circle. My BFF just sent me the new Tim Holtz Snowflake Texture Fades Folder and I thought it would be perfect for the challenge. I just love this embossing folder, especially with the Core'dinations paper! Don't forget to check out the Holiday Sale going on now at Artistic Outpost! Wait, thought I was your BFF, and I am pretty sure I didn't send you anything! Love the card! This is fantastic. I loved the image when you first showed him to us. This is really grand! I love the background paper! How fabulous! It looks like wall paper to me. It is wonderful with that ribbon and "jewels!" I have that stamp too. The lattice circle sure sets him off perfectly. Wonderful card. Beautiful card, love the colors and the bling. Excellent work. Gorgeous card and fabulous use of the sketch! Love everything about it! gorgeous card! Love that Santa! Lovely Lisa! What a brilliant idea to make the Santa medallion removeable. 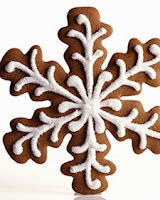 The embossed snowflake background is gorgeous with or without that stunning Santa! Wonderful vintage feel! Thanks for playing with Speedy's Friends! Wow! You always amaze me with your creations. I love that it can be removed and used as an ornament and I love the rhinestone broach. BEAUTIFUL!!! This is stunning! Love the design of this. Thank you for playing with Speedy's Friends. So gorgeous and elegant, Lisa! Love that lattice framing and wonderful vintage Santa! what a fetching card! I adore the stunning image you used! Oh so elegant, Lisa! Love the Vintage Santa! How CLEVER to be able to use that FAB Santa as an ornament! LOVE the background, too! FAB card!